The QR Code option will allow your employees to punch in and out by just scanning their individual QR Code. The QR Code option will take the employee's picture when they are punching in - so you can verify they are actually at work and doing the punching. After your employee scans their code they will be brought to a dashboard that will tell them their punch status and take their picture. For their picture to be taken the employee has to be punching in from a device that allows the use of HTML5 Video (Android Devices, Windows Products and Apple Desktops/Laptops - iPads/iPhones are not supported). The QR Code punching feature will default to use Flash if your browser does not support HTML5 video. If you are using an HTML5 enabled browser such as Chrome, Firefox, or Chrome - no setup is required. 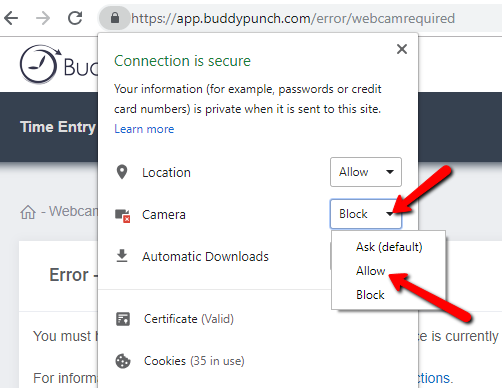 Buddy Punch will recognize the camera when you visit the QRC Login page.